by Constance Backhouse, Professor of Law, University of Ottawa. Published with the University of Toronto Press, 1999. 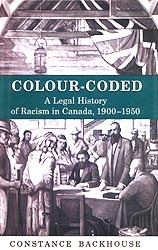 White supremacy had a tenacious hold on the historical roots of the Canadian legal system. Backhouse presents convincing case studies to illustrate how early 20th-century law played a dominant role in creating and preserving racial inequality. The cases focus on Aboriginal, Inuit, Chinese-Canadian and African-Canadian individuals, taking us from the criminal prosecution of traditional Aboriginal dance to the trial of members of the ‘Ku Klux Klan of Kanada!